Can a business process management (BPM) strategy be a truly viable option for modernizing legacy apps? 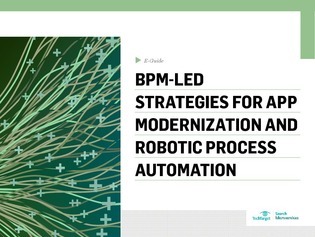 In this e-guide, expert consultant Tom Nolle explores how organizations can leverage BPM to transform legacy apps effectively within a modernization framework. Discover how workflows, APIs, and microservices fit into this framework and your modernization implementation. Inside, learn how BPM technologies will need to support disruptive robotic models being introduced by Uber and AirBnB, given that robots can gather more event-related information than humans.